We like to use the Birchwood Casey 2″ and 3″ orange “Target Spots” stick-on circles (with diamond centers) for shooting at 300 yards and beyond (photo right). These give you a very precise aiming point if you align your cross-hairs with the corners of the diamond. However, we know that some guys, particularly those whose scopes have “target-dot” reticles, prefer to have a small box for an aim point. 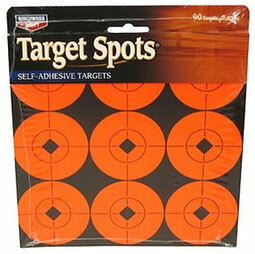 In addition, the orange Target Spots are not a true “Day-Glo” color, so they may seem a little dull (low-contrast) when the target is in shadow. For guys who want an ultra-high contrast target with a square box in the center, Birchwood Casey offers a series of neon green targets with box centers and spike-style extended vertical and horizontal lines (like on a compass). The manufacturer explains: “These newly-designed adhesive Target Spots come in highly-visible Atomic Green. The crosshair design fulfills the needs of open-sight shooters along with scope users. Easily line up your open sights on the center square or lay the crosshairs along the vertical and horizontal diminishing lines.” You can also rotate the Atomic Green Target Spots 45° to create a diamond center with the crosshairs in an “X” pattern. We’ve sampled these targets. The Atomic Green background is a true “Day-Glo” color (like safety signs) so these circles appear very bright on a target backer. These work well in low light. We won’t throw away our orange Target Spots, but these Atomic Green circles are a nice option. NOTE: Atomic Green spots are NOT “splatter” targets — a contrasting bright color does NOT appear around your bullet holes. Birchwood Casey sells the new Atomic green circles in various sizes. You can order a Combo Pack with sixty 1″-diameter spots, thirty 2″-diameter spots, and twenty 3″-diameter circles. Or purchase the 3″-diameter green spots in a separate pack of forty (40) circles. 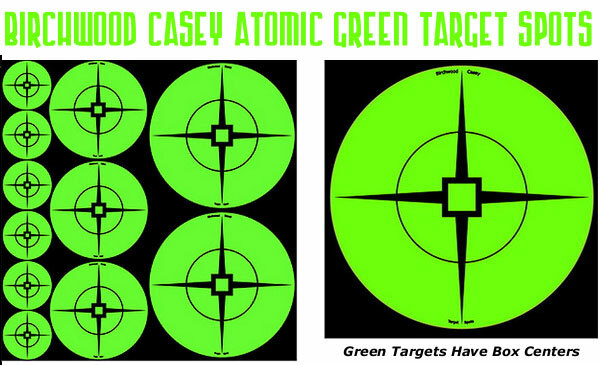 Birchwood Casey also sells 6″-diameter Atomic Green Target Spots, 10 per pack. Share the post "Atomic Green Target Spots — Super-Bright Color Aids Aiming"